California has recently instituted 30 minute checks in all segregated housing units in state prisons, adding up to 48 checks per day – an invasion of privacy. These frequent nighttime checks were established with the intent to be mental “wellness” checks, as a result of the Coleman lawsuit. Contrary to their intent, these checks cause sleep deprivation – a form of torture – resulting in reduced concentration, irritability, and other physical and mental harms. The negative impact of these checks is greatest at Pelican Bay SHU and the women’s death row at the Central California Women’s Facility in Chowchilla. Due to the unique architecture of Pelican Bay SHU, the sounds of guards opening and closing heavy doors, climbing stairs, and activating electronic sensors at each cell are louder than usual. Given that sleep deprivation is a form of torture, the Prisoner Hunger Strike Solidarity Coalition has mounted a campaign to end these frequent checks. The prisoners themselves have filed numerous individual or group administrative appeals (602s) and have or will file their own lawsuits. On December 2, the Special Master (an authority appointed to ensure a judge’s orders are carried out), a suicide expert, and lawyers from both sides in both cases participated in an investigative tour of the Pelican Bay SHU. Thereafter, the parties in the Coleman case stipulated to reduce the night shift checks to once per hour. CDCR will also bring in an outside contractor to determine if the pod doors can open and close more quietly. Generally however, the problems continue. This month we returned to PB SHU for follow-up interviews and will draft a new report. LSPC and the Ashker litigation team are calling for the cessation of these checks until it can be proven that they can be accomplished without disruption of sleep. LONG TERM SOLITARY CONFINEMENT CASE! People in solitary confinement in California prisons have organized 3 hunger strikes – two in 2011 and one in 2013 (at 60 days the longest-running hunger strike in California prison history). 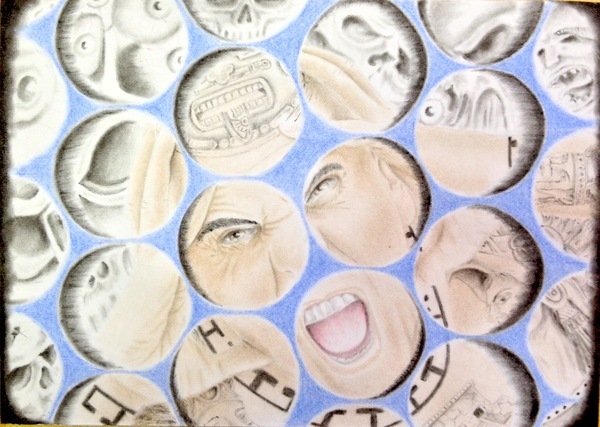 Coalescing around 5 core demands, prisoners are protesting sensory deprivation conditions inside the Security Housing Units (SHUs), the “gang validation” process that the California Department of Corrections and Rehabilitation (CDCR) uses to give people indeterminate SHU sentences, and demanding an end to long-term solitary confinement. Although the strikes have had a significant impact on public awareness, the struggle is far from over. For more details about the SHU see our report: A Cage Within a Cage: A Report on Indeterminate Security Housing Unit Confinement and Conditions. LSPC staff members have deeply involved for over a decade (see timeline of LSPC hunger striker support work) in all aspects of ongoing support for people fighting against the torture of sensory deprivation. Our work includes litigation, coalition work, engaging family members, legislative advocacy, and public education. In May 2012, LSPC joined with New York’s Center for Constitutional Rights in filing a civil rights complaint (Ashker v. Brown) in federal court. The lawsuit alleged cruel and unusual punishment, as well as due process violations in confining people to the Security Housing Unit (SHU) of Pelican Bay State Prison in California. Opened in 1989, Pelican Bay holds over 1100 people in solitary confinement, hundreds for over 10 years and some as long as 40 years. Jailhouse lawyers and political thinkers are often assigned to the SHU, and around 85% are people of color. In Sept. 2012, the federal court granted our motion to amend the complaint (originally brought by two SHU prisoners representing themselves). The 10 named plaintiffs are: Todd Ashker, Sitawa Nantambu Jamaa (Ronald Dewberry), Luis Esquivel, George Franco, Jeffrey Franklin, Richard Johnson, Paul Redd, Gabriel Reyes, George Ruiz and Danny Troxell. Two of the ten plaintiffs have been transferred to General Population. In 2014 the case was certified as a class action, expanding the classes (8th Amendment and Due Process) to around 1150 people incarcerated in California SHUs. When CDCR began transferring a number of class members out of Pelican Bay, the 8th Amendment class diminished. At that point the legal team filed a motion to amend the complaint. The court’s granting of the amendment expanded the reach of the lawsuit to former Pelican Bay prisoners housed in other SHU prisons, namely Corcoran, Tehachapi, and New Folsom. The lawsuit’s extensive discovery process lasted for over three years. We issued or responded to hundreds of written discovery requests, and produced or reviewed hundreds of thousands of pages of documents. We also hired ten mental health, security, and international law experts, each of whom submitted compelling reports. The parties completed around thirty depositions of current and former prison officials and SHU prisoners, as well as a dozen expert depositions. On September 1, 2015 a settlement was submitted to the court in Ashker v. Governor of California that will effectively end indefinite, long-term solitary confinement in all California state prisons. Subject to court approval, the agreement will result in a dramatic reduction in the number of people in solitary across the state. LSPC Staff Attorney Carol Strickman helped compile the case’s extensive expert evidence that established severe physical and psychological harm as a result of prolonged isolation. Stop sending people to solitary based solely on gang affiliation, but only on proven violation of specific serious rules violations. Immediately review people currently incarcerated in the SHUs under the new standards, which will likely lead to most being released to general population within the year. Reduce the Step Down Program for leaving the SHU from four or more years to two years and provide increased phone calls and other privileges in the steps, as well as out of cell programming. Federal Magistrate Judge Nandor Vadas will oversee these reforms for two years, a term that may be extended if the CDCR is found to be violating prisoners’ constitutional rights or the settlement agreement. Plaintiffs’ counsel will receive extensive documentation of the new policies and practices and will meet frequently with Judge Vadas to oversee the agreement. In addition, the reps will retain their hard-won seat at the table to meet semi-annually, along with the Ashker legal team, with California prison officials. LSPC Staff Attorney Carol Strickman will be among the legal counsel helping to monitor CDCR compliance with the agreements. The monitoring team will review the progress of the settlement, discuss programming and Step Down Program improvements, monitor prison conditions, and present the magistrate with any problems. LSPC staff Carol Strickman, Jerry Elster and Azadeh Zohrabi with members of the Prisoner Hunger Strike Support coalition at a 2013 Candlelight Vigil in Oakland for the hunger strikers. In response to the hunger strikers calls for help and in solidarity with their family members, LSPC joined with others to form the Prisoner Hunger Strike Solidarity Coalition (PHSS). The Coalition staged rallies and conducted media interviews during and between the two phases of the 2011 hunger strike. Since then, PHSS has continued to support the prisoners as they press for changes. This year our coalition launched the Human Rights Pen Pal Program to connect the community with people in solitary confinement, and an Emergency Response Network to mobilize quick and efficient advocacy to emergencies affecting people in solitary confinement in California. Prior to the 2011 strikes, Pelican Bay prisoners requested coalition members to form a mediation team to facilitate hunger striker’s communications with CDCR officials. LSPC staff have served on the team since its inception and continue to do so, both during and after the hunger strikes. The mediation team is not “neutral,” but rather advocates on behalf of the prisoners in meetings at CDCR headquarters in Sacramento. CDCR has identified the mediation team as an “outside stakeholder” regarding the development of its new SHU policies. The family members of people in solitary confinement have been instrumental to the progress we’ve made. Beyond the legal consultations our staff provides, we also work closely with California Families to Abolish Solitary Confinement (CFASC) to make sure that families are strongly represented in the development and leadership of our work to end long term solitary confinement in California.CFASC is part of the Prisoner Hunger Strike coalition and has a statewide reach, with many members residing in Southern California. The tireless organizing work done by family members in particular has essentially shifted the question of solitary confinement from an issue of punishment to an issue of torture. They have made this a potent movement grounded in love, compassion, and concern for loved ones inside. The 60 day hunger strike was suspended in early September 2013, in response to requests by Assembly member Tom Ammiano and Senator Loni Hancock, who are chairs of their respective Public Safety Commitees. “The inmates participating in the hunger strike have succeeded in bringing these issues to the center of public discussion and debate,” they said. “Legislators recognize the core concerns raised by the inmates and their supporters, and need no further sacrifice or risk of human life.” They committed themselves to addressing the issues raised by the prisoners. The legislators convened a joint hearing on SHU conditions in Sacramento on October 9, 2013. A hundred family members and supporters from around the state attended and gave public comments, and LSPC Executive Director Dorsey Nunn was among the witnesses who provided testimony. See [Sacramento, Abolish the SHU Today!] for a short but powerful video documenting the strong emotions of the day. In 2012 and 2013, LSPC attempted, with other allied organizations, to get conduct credit for SHU prisoners restored. We argued that, since SHU placement is considered “administrative,” and not “punitive,” those prisoners who have remained free of rules violations should not be penalized with longer prison terms. Our staff does presentations at universities, conferences and community events about our work to end solitary confinement. We have presented at the UC Student Association Lobbying Conference, The Hastings Race and Poverty Law Journal Symposium, Scripps College, the National Lawyers Guild Annual Convention, San Francisco State University and UC Berkeley, among others. In 2013 LSPC staff and interns organized an interactive art exhibit featuring original artwork from dozens of men in the SHU. 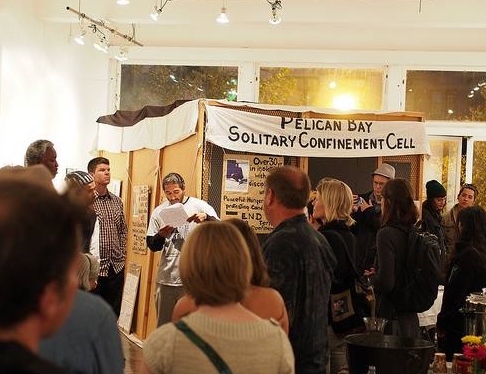 The exhibit included a life size replica of a Pelican Bay SHU cell, a room with a slide show of poetry and writings of people in the SHU, and an altar with photos and statements to the world from people in solitary confinement, and memorials for those who died during the strikes. LSPC and Center for Constitutional Rights and California Prison Focus filed two documents concerning prolonged solitary confinement in the United States to United Nations bodies – a submission to the UN Human Rights Council and a joint report on US compliance with the Convention Against Torture. Both drew on the legal research conducted for the Ashker case. 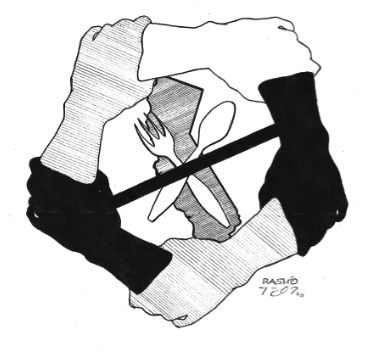 The first hunger strike was organized and initiated by prisoner activists in Pelican Bay (the Short Corridor Collective) in July 2011, to protest the harsh conditions in the state’s solitary confinement cells. Thousands of other prisoners in 13 prisons throughout the state quickly joined, with strong leadership also coming from Corcoran Prison. People in solitary confinement in Security Housing Units (SHUs) spend almost 24 hours a day alone in their (sometimes windowless) cells with virtually no meaningful activities. When family members are allowed and able to visit them, they are not allowed to touch. People being held in extreme isolation were not sentenced to this punishment by a judge. The prison administration claims to isolate people for safety reasons. Many of these people have not been written up for engaging in behavior that threatens the prison’s safety and there is no evidence that this practice has led to less violence in the system. On August 23, 2011, following the 2011 hunger strike, the Assembly Public Safety Committee held an informational hearing on solitary confinement. Hundreds of family members and supporters from around the state attended the hearing and rally held on the Capitol steps. LSPC Executive Director Dorsey Nunn testified on a panel of advocates. Dozens of family members offered their personal statements during the public comment period. In 2012 the Pelican Bay representatives boldly envisioned an even greater level of unison, as seen in their Agreement to End Hostilities – a call for an end to race-based aggression among people in California prisons. In it they stated that “collectively, we are a mighty, empowered force” and asked for all incarcerated people in California to turn their attention instead to working for “substantive, meaningful changes” in their conditions. For more information on how you can get involved, please check out the PHSS Coalition’s blog, and see the San Francisco Bayview newspaper for in-depth articles and analysis by people incarcerated in the SHU’s.